How to keep Chapters While converting DRM Audiobooks? 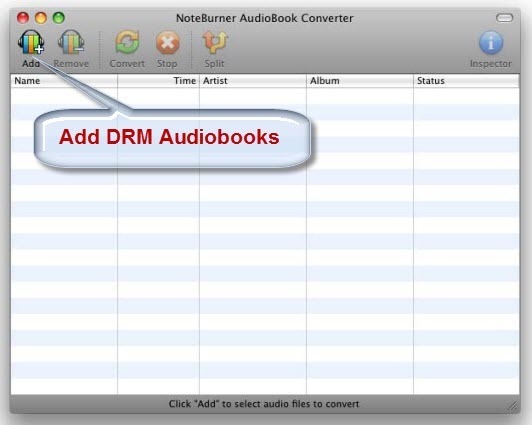 NoteBurner AA Audiobook Converter: Convert DRM AA to MP3 on Mac OS X. "I have many collections of audiobooks on my iTunes library. And what I want to do is to move them to my MP3 player and Android phone. How can I manage to do it? And can I keep the chapters in audiobooks? " Since the audiobooks downloaded from iTunes Store are DRM protected, you are not able to directly move DRM audioboos to MP3 player or Android phone. They are only allowed to be played on iTunes or iOS devices. But there still some ways to play iTunes DRM audiobooks on MP3 player and Android phone. The best and easiest one is to remove DRM from iTunes DRM audiobooks and convert M4B audiobook to MP3 or other common audio formats for playing on MP3 player or Android phone. To convert DRM audiobook for MP3 player and Android phone, what you need is a perfect iTunes DRM audiobook converter like NoteBurner Audiobook Converter for Mac. This program is particularly designed for Mac users to remove DRM from not only iTunes Store but also Audible AA audiobooks. Besides, NoteBurner DRM audiobook converter supports to keep chapters when converting those DRM audiobooks. Supported OS Mac OS X 10.9, 10.10, 10.11 and 10.12. After successfully installing the NoteBurner Audiobook Converter for Mac, just double click at the icon to launch the program. Then click the add button on the left top of the main interface to choose audiobooks for converting. Or another way to import audiobooks to the program is to directly drag and drop the files to it. Click the Preference button, and then choose Advance option. 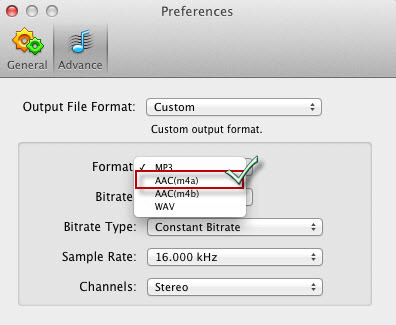 Then choose output format before converting. If you just need to move DRM audiobooks to MP3 player, you can choose MP3 or WMA format. But in order to convert DRM audiobook with chapters preserved, you need choose AAC(m4a) as output format. Finally, click the convert button to start to convert DRM Audiobook to M4A with AAC codec on Mac. After the comversion completed, you can get the common audiobook files without DRM protection. And also you can transfer them to audio players that support M4A for playing back. And if you have chosen MP3 or WMA as output format, you can split the converted audiobook into several parts by clicking the split button.